The monkey is a frequent symbol in Japanese culture, particularly in Buddhist and Shinto traditions. Tendai Shinto-Buddhism is centered around the shrines at Kyoto’s Mount Hiei where the main deity is Sanno (山王), or “mountain king”. His messenger Tsukai (使い) is a monkey. In Tendai doctrine, three is an auspicious number and it is believed that the story of the Three Monkeys – see no evil, hear no evil, speak no evil – originated at Mount Hiei. 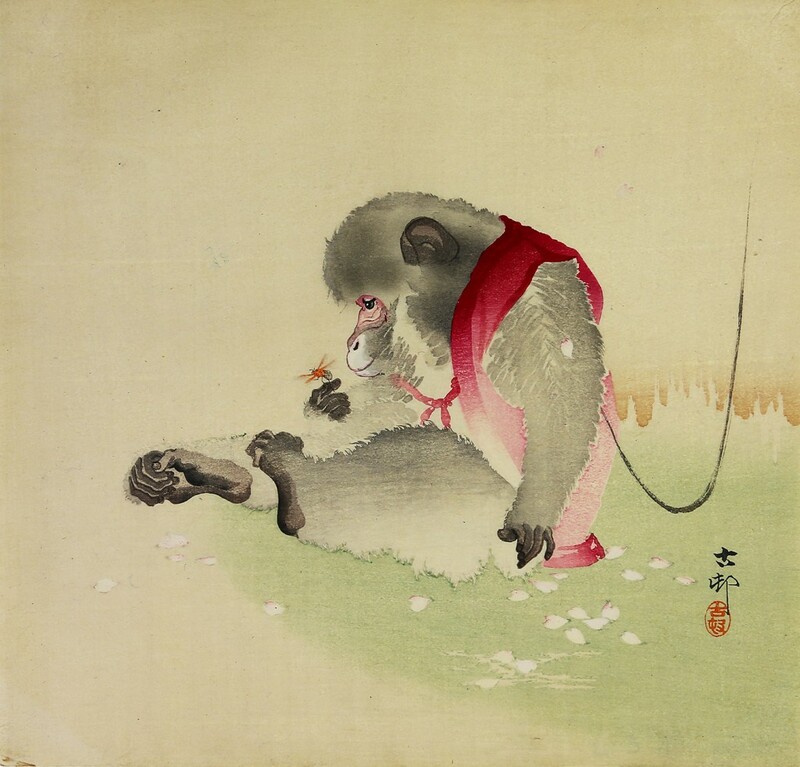 Ohara Koson’s print depicts a Japanese Macaque, identifiable by its brown-grey fur, red face, and short tail. Monkeys inhabit all the islands of Japan except for Hokkaido, but urbanization has pushed them into mountainous areas. It is said that the wilds of the mountains are a crossroads between the world of humans and the world of deities, or kami (神), and that monkeys serve as divine messengers between the two worlds. Monkeys are also believed to protect against disease, guard against demons, and assist fertility. The color red, worn by the monkey in this print, is symbolic of this power. In the Edo period (1603-1867), monkey worship was at its peak; but it remains common today to find stone statues of monkeys at shrines and temples. Monkey key chains are also distributed at shrines as good luck charms, and these often incorporate the color red. Ohara Koson, who lived and worked after the Edo period, is known for his humorous and playful depictions of animals and for his bird and flower prints (kacho-e). Building on the international success of Edo period ukiyo-e prints, Koson’s woodblock prints were produced primarily for a Western market. Mark Schumacher, “Monkey in Japan”, Japanese Buddhist Statuary, onmarkproductions.com. “Monkeys in Japanese Culture”, America Pink, america.pink. Dentsdelion Antiques Newsletter XIV, no. IV (September/October 2014), dentsdelion.com. Mark Schumacher, “Monkey in Japan”. “Ohara Koson”, Hanga Gallery, hanga.com.